into the Capitol. It may be descriptive but it’s true. Sen. Reid’s response to the tired, huddled mass of tourists is to lift high his can of air freshener. my best shot is that the air conditioning of his office needs to be clean. Bacteria and mold grow very fast into it and it should be cleared every 3 months. I have a friend that worked in a bank under the a.c and one night he woke up soking in his own blood that came from his ears. Seems that a.c bacteria made a nasty infection and he lost his hearing almost 70%. No need to say that he sue the bank for negligence. And the Statue of LIberty, does she use deodorant or doe she have a major french BO? Every morning I take my kid to school and I pass in front of the head quarters of the Secretary of Enviromental Issues (if this is what we call it in English), anyways it is the place where the city hall of Sao Paulo should de discussing and resolving enviromental issues of the city. Paralel to the street flows the one of the most polluted river ever - Marginal Pinheiros River. A dead stinky river that has the most horrible smell ever! So, the street of the head quarters not only smell bad from the river, but also it seems that all the crap from that neigborhood is flowing under the building, mixing its stench to the smell of the river waters! If the lights turn red at the crossroad, in front of that place, I just pass it fast, otherwise you stand there for a minute feeling that you will pilk your brains out. So, I heard from the Sense of Smell Institute that our noses get tired of the same smell, so after a while we don´t quite feel it. Is it possible that our secretary got used to smell crap & rotten river notes???? Is it possible that he bends in his knees every morning and stick his head inside a toilet in order to face an entire day at the office? The stinky river may well have numbed the nose of your Secretary of Environmental Issues. 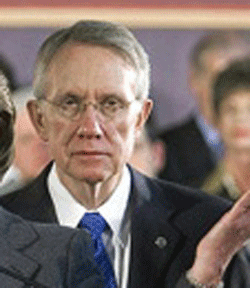 Senator Reid's problem is the opposite--he has a sensitive nose but a tin ear for politics.